One day last year I was putting grocery bags in the car after an epic store trip, and after I grabbed the last bag something caught my eye in the back of the cart: a $3.75 package of pacifiers. I somehow missed them when I was handing items to the cashier, so we hadn’t paid for them. I had all three kids strapped into the car, they were all overtired and on the brink of major meltdowns, the store was crowded with 10+ minute waits to check out, it was already well past dinner time, and some rumbling thunder indicated that it was about to rain. It seemed virtually impossible to go back into that store. But I really needed those pacifiers. My one-year-old lost her other one and wouldn’t sleep without it; they were the main thing I’d gone to the store to get. I decided that I would take them and pay for them next time I went to the store. There was, of course, no question in my mind that I would pay for them. I’m not a thief. I would never steal anything. The next time I went to the store, however, I forgot the box for the cashier to scan. The next two times after that my husband went and I didn’t want to trouble him with it. The time after that I was in a huge rush and forgot about the whole thing. The time after that…Well, you get the idea. As the weeks turned into months, the need to pay for the pacifiers felt less and less urgent. I told myself that I was definitely going to pay for them eventually, but it kept not happening. All of this fuzzy thinking suddenly got a whole lot clearer one afternoon, a couple months later, when I was preparing to go to Confession. He would undoubtedly ask me how long ago I took these pacifiers from the store. And when I told him that it had been more than three months, it would suddenly be crystal clear what was going on: I had stolen them, and I was lying to myself about it. It is an uncomfortable moment when the lies you tell yourself to excuse your sins are dragged out into the light and exposed for what they are. Knowing that I would have to explain my actions to another human being made me realize the uncomfortable truth: I had stolen. And, given the fact that three months had already passed without me making it right, it is unlikely that I would have ever remedied my actions, all the while telling myself that I hadn’t done anything wrong because one day I would make it right. The discomfort of this newfound awareness of my sin motivated me to break through the morass of my laziness and lies and get down to the store to give them my $3.75. This is why I love Confession; this is why I need Confession. As I recently discovered, evil always works through lies. I regularly confess my sins to God in private prayer, but when my confession remains within the safety of my own internal thoughts, it is fertile ground for lies to run wild. Too often my silent confessions to God tend toward mental meandering, bringing up only certain sins that are at the forefront of my mind, skipping over some of the older ones that lurk comfortably in the shadows. Too often the little stories I tell myself — “I’ll pay for it later” — sound pretty good when they’re fleeting thoughts in the shelter of my head, safe from the scrutiny of another human being. But Confession drags my thoughts out of the shadows and forces me to examine my sins in the full light of day. Having a set place and time where I must account for all my sins since the last Confession remedies my all-too-convenient tendency to “forget” certain things. Having to codify my thoughts into spoken words brings clarity to all those amorphous ideas that ebb and flow in my brain. Having to go over my sins with another human being — to be questioned about my actions by someone whose voice is much less easy to ignore than the still, small voice of God — brings conviction and humility in a way that private prayer cannot for someone as spiritually immature as I am. And, as I’ve said before, while the process of verbalizing my sins might be uncomfortable, being able to hear the words of God’s forgiveness that the priest says in persona Christi helps me know and feel God’s mercy. After seeing the power of Confession in my own life — in the case of the pacifier and so many others like it — I don’t need any theological book to know that this Sacrament is a gift God gives us to help us really understand the weight of our sins, and the power of his perfect love. « Could I have stopped the war? Looking at that list you linked to – I’d never thought of time wasting as stealing – what an interesting perspective! Wow. You have NO IDEA how much I needed to read this post today. I hope you realize what a true blessing you are! I am right there with you. I often “forget” to mention those little nagging sins too. I am a Catholic educator and teach my children the proper way to give a good confession and struggle to do it the right way myself. I love your blog and may God bless you and your family. Oh dear, you made me remember a pair of $1 mittens stolen over a year ago! I had never thought to confess them as stealing as I always figured that I would pay for them. But, I haven’t; so I guess I need to add that one to my list for confession. Thank you. Thanks for this great post. I’m a convert too and I think there is so much misconception about Confession amongst the Evangelical community – I hope some of them read this! I’m a little stressed about my upcoming first confession. I imagine it is sort of like jogging, at first it is really hard and you just have to plow through and stick with it even though it hurts, you know you’ll be really sore afterward but you’ll also have the endorphin rush and the knowledge that you are doing something good for your body. And it gets easier the more you do it. At least this is what I am telling myself. I hope it is OK to take a list with me, I’ve got years and years of things to confess and I’m sure I’ll be emotional and forget things otherwise. Amen, amen, amen — a thousand times amen! Having accountability in the form of a real, live person has really helped me grow spiritually and has made me more mindful of my sins. 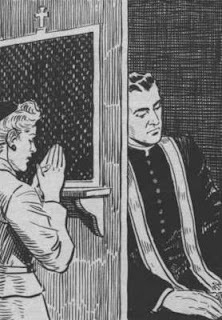 I understand the value of confession; but I do wish it were still the old style (you know, with the partition between you and the priest) rather than face to face. I don’t know if I could ever bring myself to do the face-to-face Reconciliation. Excellent posting! I think it’s hard for some people to understand why confession is such an important sacrament. I have had plenty of people tell me that they confess their sins to God, so why would they need to go to a priest. I tell them, knowing that you’re going to have to go tell someone else (in person) the horrible things that you do makes you rethink a whole lot of things. I do think you could verbally confess these things to God without “going to Confession.” However, it is very true, a theft is a theft, and must be repented of. I don’t think it was wrong, in your situation, to decide to pay next time. It was wrong, though, as you said, not to follow through. I had almost exactly the same situation with a package of Chapstick, though I got back to the store two weeks later. Still, it weighed on my mind during those two weeks. You’ve articulated why I both look forward to and fear confession. I look forward to having to think about my sins and remember them, and to having the weight of my sins off me. I fear having to tell a priest, another human being, all the awful things I’ve done. I look forward to knowing God’s love and mercy in forgiving my sins, but I fear being confronted with my acts. Great posts on confession, Jen. Canon law dictates that that a penitent must always be given the option of confessing anonymously. Even in a reconciliation chapel, I have never NOT seen a partition of some sort (even if it’s a simple kneeler with a raised screen blocking the priest’s view of the penitent). Your parish’s pastor has a canonical responsibility to provide you with the option of choosing to go either anonymously or face-to-face. But personally, I find going face-to-face so rewarding, I can’t imagine choosing to go anonymously. I wish confession was part of the Protestant tradition. You Catholics get it right on this. Huh. I have almost the opposite perspective. I find it much harder to believe I’m pulling one over on God (who knows everything, and whose nudgings of my conscience are impossible to ignore) than to conceal things from another person. True, I’ve never done one-on-one Confession, but I’ve had therapy and found that 90% of the time I was fretting over what the therapist would think of what I said. I never have that with God, because whatever He’s going to think of what I did He’s thinking it already, so my only choice is between accepting His help or refusing it. I notice that your breakthrough actually came not from speaking to the priest but from examining your conscience on your own. But I agree completely with your last paragraph! The ritual of confessing and the opportunity to be forgiven are great blessings. Pamc: Confession IS part of some Protestant traditions. In the Episcopal Church, we say a prayer of Confession before receiving Communion, every single time. Usually it’s just before the Peace, but now during Lent we have Confession at the very beginning of the service. 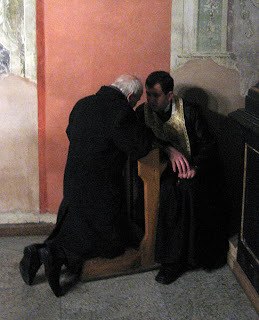 We also have a sacramental rite for one-on-one Reconciliation of a Penitent, but that’s only used if you’ve done something so terrible that you feel you can’t resolve it through the general Confession or your private prayers. I didn’t realize something like that was a sin, I always saw it as a little blessing. I read this yesterday but since the stores were closed I had a small grace period. I figured if I didn’t go today that I would have to call it a sin, so I just got back from making things right. The baby and I walked in the rain to do it. great post — haven't we all had moments like that? !